Learn how to save it for YOUR retirement. In total, American employees are $4.1 trillion short of what we need to retire comfortably. ** At PAi, we want to change that. Start on the path toward retirement readiness and use the Retirement Calculator to project how much you’ll need saved to enjoy the retirement you’ve always envisioned. 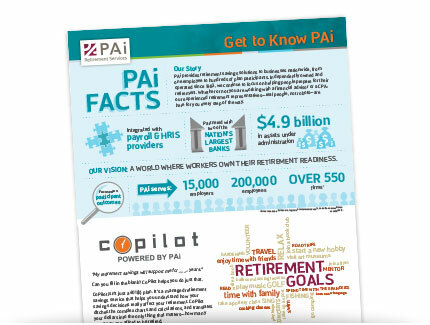 Learn more about our services and our commitment to helping develop a retirement ready world. Just 59% of employees say they have tried to calculate how much income they would need each month in retirement. * Knowing how much is just the first step. This easy-to-use tool helps paint the picture of what you’ll need in retirement to help create a plan to get you there. A 401(k) plan allows you to contribute to your retirement with pre-tax contributions from your paycheck. Learn more about the benefits of saving for retirement pre-tax. Employees that have changed jobs in the past may have started saving in a retirement account with a past employer, and many employees are unsure what to do with the funds in the account or what their options are. Use this resource to learn your options and find out how to rollover funds to a new retirement account. Starting to save for retirement earlier in life will allow your initial investment more time to grow. Learn more about how total returns on your initial investment will likely increase with the addition of compounding interest. When withdrawing funds from a qualified retirement account, such as a 401(k) or IRA, it is important to know your options. Learn more about some of the different distribution types and what qualifications each type requires. * The 2017 Retirement Confidence Survey, Employee Benefit Research Institute, 2017. ** EBRI Retirement Security Projection Model – Analyzing Policy and Design Proposals, Employee Benefit Research Institute, 2018. Saving for retirement is vitally important for the members of today’s workforce, and unfortunately, a huge portion of American employees are drastically behind in retirement savings. 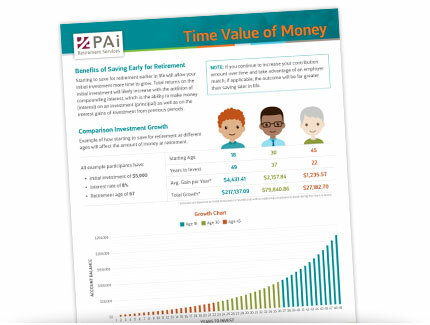 Learn about saving for retirement and common savings strategies to enhance your overall retirement readiness. Many Americans feel unclear when it comes to Social Security and collecting benefits, and with a huge number of claiming strategies and conflicting opinions on the best time to collect, it’s not hard to see why. Let’s clear up some of the confusion by starting with the basics. Withdrawing funds from a 401(k) can be stressful, especially since specific information regarding 401(k) withdrawals seems to be hard to come by. Luckily, we’re here to help.